Are you looking for a new hobby? Or perhaps you are part of a group that needs t-shirts made, but you’re not keen on paying to have them made by a company? There are quite a few heat presses out there that will do the trick – but how do you know which one to choose? Let’s look at a leading press on the market: the Super Deal Pro 12 x 9 Digital Swing Away Heat Press. Even if you’re just looking for a way to personalize your clothes and make your own graphic t-shirts, a heat press like the Super Deal Pro might just be what you’re after. You can transfer any image onto a t-shirt, a tote bag, or even a plate! It boasts a swing-away arm to get the heat plate out of your workspace, as well as a Teflon-coated plate. Overall, it looks effective and easy to work with. But not everyone has been impressed by this machine. Some users have complained about the press breaking down after a couple of uses and there have also been concerns about the quality of materials used in the machine’s manufacturing. Before you make any final decisions, let’s take a more in-depth look into the Super Deal Pro Heat Press and then you can decide if it’s right for you. Product Dimensions: 16 x 13 x 14.5 inches. Plate size: 12 x 9 inches. The Super Deal Pro’s plates are 12 x 9 inches and are Teflon-coated, so you don’t have to worry about your transfer image or your t-shirt getting stick to the plates. The plates also contain heating coals throughout them, ensuring the temperature stays consistent. One of the most prominent features of this heat press is the swing-away arm. This feature ensures the top heat plate is out of the way when you retrieve a pressed item. Overall, it makes accidentally burning yourself more difficult, and anything that keeps a user safe is a great feature to have! The Super Deal press heats up from 0°F to 399°F. You are able to set and monitor the temperature of the press from the display on the control box on top of the machine. No need to guess if you have the plates hot enough. The heat press also has a timer on it, so you don’t have to guess how long you’ve been pressing something. The timer is adjustable from 0 to 999 seconds (a little over 16 minutes). With this feature, you don’t have to worry about setting your own timer; Super Deal has it covered. An alarm will go off when the time is up, letting you know it’s time to remove your material. You can also regulate the pressure of the machine. This will ensure the object you’re transferring the image onto isn’t crushed. You can change the amount of pressure based on how thick your item is. Just use the pressure knob on top of the handle. Once the plates are firm against one another, you will get an even amount of pressure. The Super Deal Pro Heat Press comes with a 12-month limited warranty, which really only applies if your press comes broken or is defective because of a fault made by the manufacturer. When you are pressing your transfer onto the item of your choosing, you don’t have to worry about the temperature fluctuating all over the place. The aluminum heat plate ensures the temperature stays consistent through the whole process. If it didn’t, the machine could scorch your items, or the transfer might not stick at all. An even heat helps reduce those frustrating issues that can arise from spotty temperatures and helps to take some worry out of the process. The Super Deal Pro heat press also allows you to transfer a variety of things onto a ton of different items. With this press, you can transfer images, words, numbers, or even your favorite character from television. You can transfer onto t-shirts, bags, mouse pads (if people still use those), ceramic tiles, plates, or anything that has a flat surface. The possibilities are pretty much endless! Whether you’re making products for an occasion, gifts for friends, or band merchandise, expect this heat press to give you a wide variety of options. Super Deal Pro also didn’t cut corners with the safety of users. The swing-away arm on the top heat plate ensures you can move the plate completely out of the way, preventing accidental burns when either putting your item on the plate or taking it off. The timer feature also ensures you know exactly when the process will be over. An alarm goes off when the time is up, so even if you walk away, you won’t accidentally leave the item to roast or cool awkwardly. With the easy-to-control temperature and time adjustments right on the control box, located at the front of the machine, the Super Deal Pro is quite easy to use, even if you are new to working with a heat press. Just press a few buttons, let the plates warm up, press the top one on to your item, wait until the timer goes off, and you’re all set. This makes production a breeze, which is especially useful for small businesses. And those looking to do so, or just dabble in the craft, will be less intimated by a machine that’s easy to maneuver. This heat press is easy on the wallet, surprisingly so, given all the positives mentioned above. But we won’t complain about not spending an arm and a leg for the Super Deal Pro Heat Press. Its affordable price makes it easy for those looking to get their feet wet in this craft, and makes it easier for those on a budget. Other machines with the same features are usually advertised at a much higher price so we’d definitely say this is a ‘super deal’. 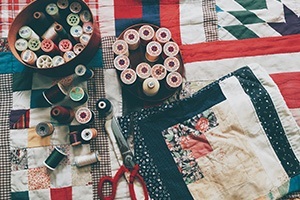 It’s easy to use, affordable, and safe – the perfect recipe for beginner crafters. You won’t have to worry about spending a lot of time fumbling with this heat press. The safety features are great for those who aren’t used to watching out for heat press plates, and will ensure that beginners aren’t left with annoying burns from trying their hand at pressing some shirts. The price makes it easy to dabble and learn about the machine without investing too much straight away, which can be deterring for those starting out. While a warranty is also helpful for beginners, it’s really beneficial to all buyers – who wants to be left with a lemon? The Super Deal Pro Heat Press comes with a 1-year limited warranty, covering you should your heat press arrive with manufacturing faults or errors in craftsmanship. Should the product not work as advertised, you’ll be able to contact the company who will decide whether they need to repair or replace your machine. This warranty means you won’t have to foot the bill for it. Multiple users noted that their heat press either broke down after a few uses or came already broken and not working. One user even had their press break down after only a week. While this isn’t the most expensive heat press out there, and issues like this would be covered by the warranty, it is still enough that customers should consider the advantages very carefully before risking this disadvantage. Some users also had issues with the press smoking while it was in use. Smoke coming from any machine can be very dangerous! While user-error could be an issue here, this is definitely something you want to consider or look out for when buying. Quite a few testers complained about how the pressure knob and/or the control box came loose while they were using the press. Some stated that this was a regular occurrence. Pieces coming loose seems to be a common issue with the Super Deal Pro heat press. Not a major issue, and can be easily put back into place, but if you’re using this machine continuously it has a potential to be an annoying feat. There were also a few users who complained that the plates weren’t big enough. If you are pressing any kind of adult-size clothing, you must press it more than once to get the whole image transferred on. The heat press is 12 x 9 inches, so be sure to evaluate the projects you have in mind before buying. While this will suit those looking to produce smaller items, or prints on occasion, those looking to push out product may find it daunting. After going over all the positive and negative attributes of the Super Deal Pro 12 x 9 Digital Swing Away Heat Press, we are cautiously recommending it. While it definitely has some great features, like the swing-away arm that gets the hot plate out of the way, the Teflon-coated plates, and that it can press a lot of different items, the fact that users have had som duds arrive can be a cause for concern. Parts coming loose and situations where it smokes are also cause for concern. That being said, you are in the market for a heat press, you might want to try this one, the price is right and a lot of the concerns can be addressed through the warranty. The Super Deal Pro Heat Press has really turned some heads thanks to its performance and versatility. And at the price it’s advertised at, it’s not hard to see why. While it’s best to check specialty shops or crafting stores, the Super Deal Pro may prove trickyto find in-store and online. There’s not much for an online presence with this company, but thankfully, you can find this heat press on Amazon. That’s all for the Super Deal Pro review. Tempted to give it a go? The Super Deal Pro Digital Swing Away Heat Press is true to its name, it really is a super deal! It's easy to use, versatile, and a great starter machine for beginners. While the cons should definitely be considered, you can't ignore the price.